The International Monetary Fund (IMF) is committed to continuing its support of Greece after the end of the fiscal program in August, but there is work that the country still needs to do, especially in structural reforms, IMF Managing Director Christine Lagarde said on Thursday. 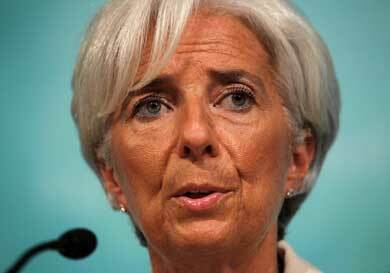 Lagarde also criticised the policy of public spending cuts, which she said the IMF had never advocated. “We know that some of those (economic) successes – and they were good results, often better than expected – are attributable to very drastic measures that were decided by the Greek government, not necessarily on the advice of the IMF, because we have not advocated for additional public spending cuts. So much has been cut,” she noted. Brussels and Athens are now turning their attention to Washington, where critical discussions on Greek debt relief will be held on the sidelines of the spring International Monetary Fund and World Bank Spring Meeting. According to Athens-Macedonian News Agency’s sources, the Europeans welcomed the IMF’s estimates for the medium-term course of the Greek economy, which showed greater convergence with those of Europe. At the same time, European officials are now convinced of the IMF’s “will” to activate its programme for Greece before the European part of the programme is completed. In addition, in the last few months, the Eurogroup Working Group has been working on the technical work to specify the debt relief measures to be implemented after the end of the programme, but also on the so-called ‘French mechanism’ for linking growth with the repayment of Greek sovereign debt. In any case, the IMF’s intentions will be obvious over the next few days and during the meetings that will be held among the participants in Washington.